Steven (Chicagoland, United States) on 21 December 2010 in Architecture and Portfolio. 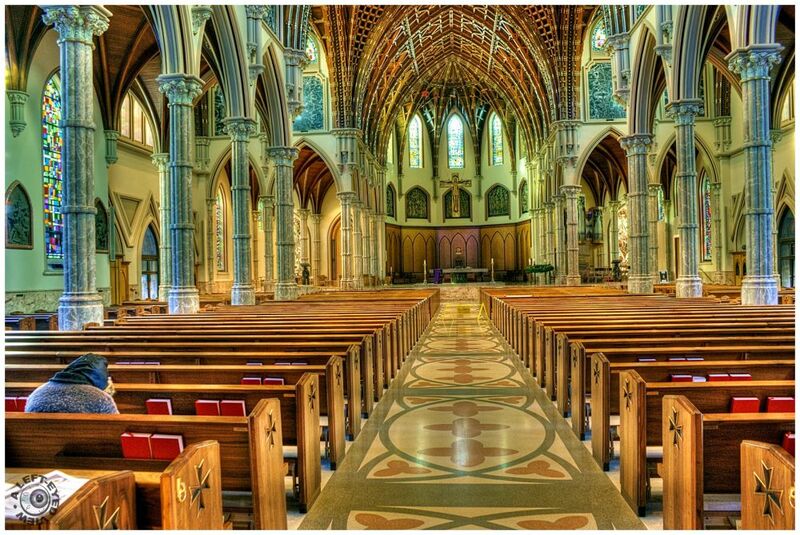 View up the aisle at Holy Name Cathedral in Chicago, Illinois. The master of tone-mapping delivers again an amazing, impressive shot. Colors are great, love the red books against the blue/green hints. I like the slightly off centre viewpoint which has allowed you to frame the single character in solace. The light and tones are everything that we have come to expect from your tone mapping Steven. Des couleurs superbes et une belle luminosité. J'aime beaucoup. Again, your presentation technique reaches into the very darkest of corners and brings them to life. Great Title Steven - and this IS a great view here...I don't think I would mind sitting through a service because my eyes would be wandering everywhere anyway! I agree with Mariana - the person in the pew there is an excellent addition! How beautiful this is! Respect! So bright, so many details - great shot!!! très beau travail sur les couleurs. Beautiful! I agree, the woman in the pew really makes it extra special. Fantastic, the HDR gives the a black light quality. I like seeing the one woman there. It draws us away from architecture to people which is what the architecture is about. I see your skills in church photography has made have made an enormous leap! Just awesome!